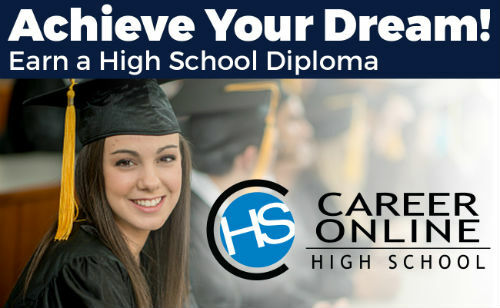 Career Online High School (COHS) is an online high school diploma and career certification program funded by Frisco Public Library. Residents of Frisco who have completed eighth grade and are 21 years old or older are eligible to apply. To qualify for upcoming scholarships, please read the information below and fill out the self-assessment below. Applicants who successfully complete an online self-assessment and prerequisite course, followed by an in-person interview, will be considered for enrollment. Once enrolled in the program, Career Online High School pairs each student with an online academic coach, who provides the student with an individual career path, offers ongoing guidance, evaluates performance and connects the student with the resources needed to master the courses. Students will be given up to 18 months to complete the program. Visit the Career Online High School website for more information on the program, including a list of Frequently Asked Questions, to help you decide if this program is right for you.